The M series collectors are of cartridge type with auto cleaning and are designed and built for continuous duty operation. The units are designed for use with abrasive blast systems. Construction: Standard construction of the unit is 11 gauge hot rolled steel, reinforced to maintain structural integrity to 15″ W.G. All wiring, air piping, solenoids and valves are mounted externally. Inlet sizes 6″ through 8″. Filter Cartridges: Filters are replaceable cartridges. Each filter has approximately 103 square ft of filter media. P/N: (011519). Number of Cartridges: This collector is fitted with two filter cartridges. Cartridges are changed from the outside of the unit. Pulse Cleaning: An adjustable timer for controlling the “ON” and “OFF” time of the air pulse is enclosed in a NEMA-12 control panel. A magnahelic gauge is provided for monitoring the differential pressure drop. 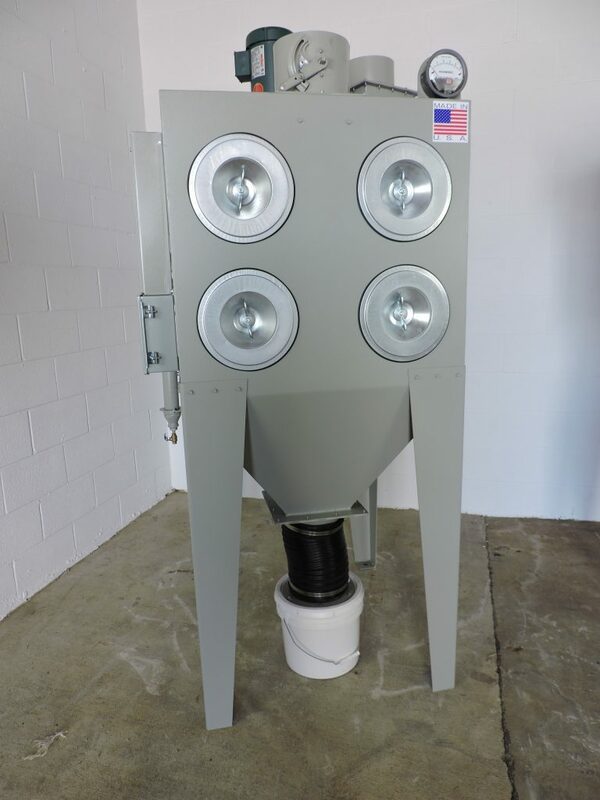 The RPJ series collectors are cartridge jet pulse units having a dust drawer of pyramidal hopper. They consist of a filter section, and a dust containment section. 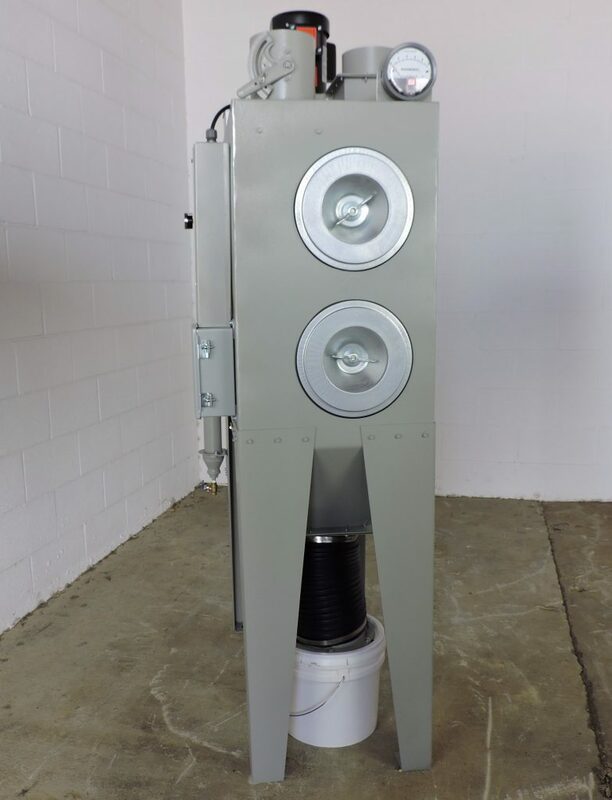 The top of the unit opens for installation and removal of the filter cartridges. The air pulsing system is located on the swing open top. The product (dust) stream enters through the inlet on the main filter section and flows around the cartridge filter media. Solid particles are collected on the outside of the filter media. The air stream then passes through the media into the middle of the cartridge and is exhausted from the collector through the exhaust fan. Compressed air jets are used periodically to shock and back flush the filter media causing the collected particles to fall into the containment section. The dust is removed from the containment section as required.